“Slick Licks That Stick!”, is an interactive, fully printable pdf eBook compilation of technique building, non-cliche musical exercises, patterns and licks, which are essential to anyone who is serious about their development as an improvising musician. “Slick Licks That Stick! (Bass Clef)”, is an interactive, fully printable pdf eBook compilation of technique building, non-cliche musical exercises, patterns and licks, which are essential to anyone who is serious about their development as an improvising musician. All exercises have been transposed to bass clef and range adjusted, with bassists and trombonists especially in mind. For Improvisers of All Levels! The musical examples contained in this eBook were chosen not only for their functionality in building instrumental technique and ear training, but also because they simply sound good; which is to say that practicing them can be fun, challenging and inspiring, all at once. Each of the examples is laid out in all 12 keys. This is important, as I have found that there is a tendency to play things in one key that one might not even think of in another. The range for all exercises is that of the Bb Tenor Saxophone, but can be adapted to the range of any instrument. 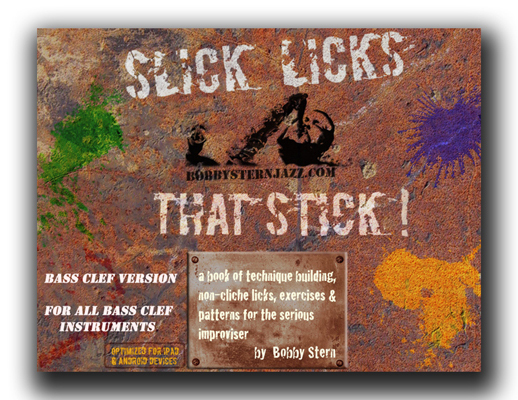 Finally, “Slick Licks That Stick!” is formatted for optimum viewing on your mobile device. Set on a music stand, the need for scrolling is kept to a minimum. So, start doing your due diligence on these “slick licks” and before you know it, they will stick - not only to your fingers - but to your mind, first and foremost!